The horsetail plant is native to Europe and has been used for therapeutic uses for many years. It also goes by the name horse bristle, and is considered a living fossil by botanists as it predates the dinosaurs. For those who own backyard ponds or water gardens, this is a plant that you will definitely want to consider adding to it, especially during spring. What Makes Horsetail So Special? Aside from its aesthetic appearance, horsetail can be used for natural remedies. In Ancient Rome and Greece it was used to treat ulcers, kidney issues and wounds. Like other plants, it has many other potential uses and is the subject of ongoing research. What is known about horsetail is that when consumed it will strengthen the urinary tract, promote growth in the nails and hair, and assist in maintaining an optimal body weight. Horsetail can be consumed by both humans and animals which commonly reside in ponds, such as fish. It is rich in saponins along with antioxidant flavonoids, and is packed with lots of potassium. Research has also shown that essential oil can be extracted from it, which when consumed will strengthen the body’s defense against harmful organisms. It has also been suggested that ointments using horsetail could potentially be used as a pain reliever. It may be possible to shop for horsetail at regional grocery stores, but if not you always have the option of growing it yourself. The good thing about this plant is that it’s hardy, and because it originates in Europe it can withstand the tough winters which are common in northern climates. However, one must exercise caution when planting it, as it can become invasive. When planting horsetail you will want to use pots and monitor it carefully, as they can reach a height of four feet. Unlike other plants, horsetail does not seed. Rather, its sprouts via a rhizome, which is a stem that extends underground. The best time to plant rhizome is during early spring when you’re receiving decent sunlight. These plants thrive in areas which are boggy and as such prefer soil which is wet with high humidity and heat. For those who own ponds in northern climates where winters get cold, the top part of the plant that is above ground can become brownish during winter, but the rhizome portion underground will thrive, and produce fresh shoots during spring. If you own livestock or horses which are in close proximity to your water garden or pond, exercise caution as their consumption of horsetail can be toxic. However, this plant is perfectly healthy for humans and fish to consume, and has a taste which has been compared to celery. You will want to pick the plants while young, peeling away the tough exterior covering and then consume them while fresh. Every part of the plant can be eaten raw with the exception of younger shoots. 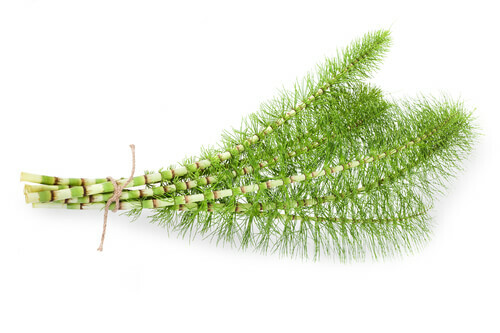 Horsetail has lots of silica so should not be consumed in excess as it can place wear on tooth enamel.